A protest will be held outside of the Dáil this afternoon. TILLAGE FARMERS WHO lost an average of 60% of their crops last year will protest outside the Dáil this afternoon calling for “humanitarian aid” from Government to help them cope with their losses. Tillage farmers in the west of Ireland had one of the worst harvest seasons in recent history last year due to bad weather conditions. Persistent heavy rain in certain areas led to significant losses of crop for a number of farmers. The areas affected extend mostly from Cork City in the south, spreading out north and westwards up to Derry and Donegal. 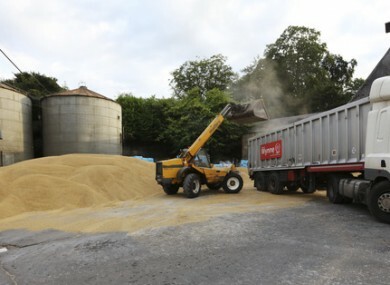 IFA grain committee chairman Liam Dunne told TheJournal.ie that about 250 farmers were badly affected. The average loss of crop for these farmers was about 60%, with some farmers having lost up to 100% of their harvest. Dunne said that losses like this are almost entirely unprecedented in this sector of agriculture. The crop was literally beaten into the ground by the end of the month and there was nothing left to harvest. In the months following, farmers recorded their harvests and passed on the information to the IFA and the Agriculture Department. The monetary losses are compounded by the cost of growing crops in the first place. Dunne pointed out that it costs about €400 to grow a cereal crop on an acre of land. The costs of seeds and equipment is incurred whether or not the grow is successful, which has put many of the farmers into serious debt. “It’s not just a matter of not having an income. Farmers are losing money as well,” said Dunne. Humanitarian support is what’s needed. The IFA and affected farmers are now calling on the Agriculture Department to provide an emergency fund to help the farmers deal with their difficult financial situation. Dunne said that when the accumulative losses of the 250 or so affected farmers were taken into account, it came to about €3.5 to €4 million. If this money was provided it could be paid back next year after a successful season. Fianna Fáil will today present a motion during Private Members’ Business calling on Agriculture Minister Michael Creed to establish a crisis support fund for the affected farmers. Fianna Fáil spokesperson on agriculture Charlie McConalogue said he was “shocked by the minister’s complete failure to engage with this issue”. “Despite calls for a compensation fund to assist these farmers, the Government has stood back and refused to move on the issue,” said McConalogue. The Government is expected to oppose the motion this evening, with the matter due before the Dáil at about 4.30pm. It is believed the Government will put forward a counter-motion in which it reaffirms it commitment to supporting tillage farmers and sets out other measures to address the losses and hardships faced by farmers after the poor season. Principal of these is the commencing the rollout of a €150 million Agri Cash Flow Support Scheme as a direct response. This scheme will function as a low interest, flexible loan for tillage and horticulture farmers for amounts of up to €150,000 at an interest of 2.95%. Liam Dunne of the IFA said that this measure would not be effective as struggling farmers may already have significant loans out with banks already that they are unable to pay back. Other measures to be put forward by the Government will include examining measures to assist struggling farmers, promoting the use of native grain and Irish malt in the manufacture of Irish whiskeys and beers and others. Dunne said he expected 300 to 400 people to attend a protest outside of Leinster House at about 3pm today. Email “Tillage farmers call for 'humanitarian support' after some lose 100% of crop in worst harvest in decades”. Feedback on “Tillage farmers call for 'humanitarian support' after some lose 100% of crop in worst harvest in decades”.